The ABC is currently implementing an Advanced IPM accreditation scheme. Crop consultants gain accreditation and are then able to nominate specific growers for grower accreditation. To gain accreditation the consultants are assessed by a panel of experienced IPM practitioners who are members of the ABC. Have a clear understanding of the role of beneficial organisms in the crop that he/she works. Use cultural controls to enhance the activity of beneficial organisms or to reduce pressure from pests. Conduct on-farm routine monitoring of pests and beneficial organisms specific to the crop grown. Can demonstrate a genuine reduction of standard farm practices or norms in the use of synthetic insecticides. That the frequency of pesticides applied and the types of materials selected is appropriate for an IPM program (for the specific crop). Consideration is given to biological control as a component of the overall pest management strategy. Have a means of maintaining and enhancing current and advanced knowledge of IPM principles and practices. 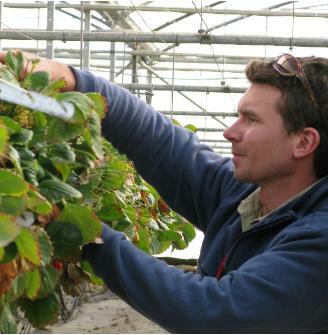 An accredited consultant can then nominate growers who fit the grower requirements. Accreditation enables the grower to use the Trade Marked IPM logo on their product. This logo is a measure of a high level of committment to IPM recognising the need to reduce chemical inputs and minimise environmental and human health impacts. 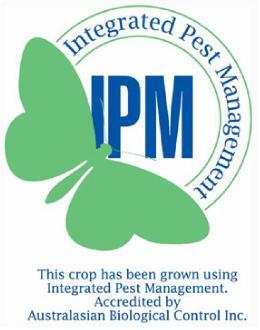 For an introduction to IPM go to IPM program notes.